It’s a ramp a slide and a stairway to imaginative fun! This simple set provides the perfect stage for fun and adventure. Kids will gain confidence and have fun at the same time as they learn to climb and slide on this brightly patterned beginning climber. 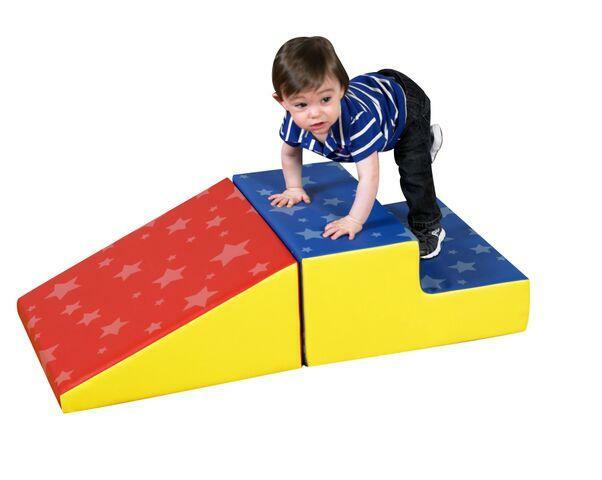 Children can safely explore new heights by climbing up steps and sliding down this foam structure. Basic Play Set is composed of two oversized soft shapes that attach together with hook and loop to initiate gross motor play. Great for any sensory room or sensory gym! THIS ITEM WILL DROP SHIP FROM THE MANUFACTURER AND TAKE ABOUT 10-14 DAYS FOR DELIVERY. Dimensions: 40" x 20" x 1"